An estimated half million vehicles were flooded by Hurricane Harvey in August 2017, but what happened to them once the storm passed? Thousands of vehicles were transported to the Texas World Speedway, and they have since been sold by insurance companies to salvage yards, dealers, and buyers throughout the world. 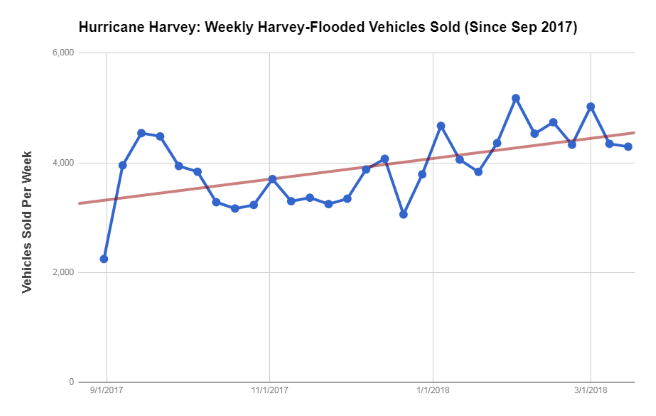 Now an average of 3,926 Hurricane Harvey-affected vehicles are sold each week. Our Flood Check Tool alerts consumers to the likelihood that the car they’re considering was previously flooded by Hurricane Harvey. Enter the Vehicle Identification Number (VIN) in the box, and the tool will tell you if that car was registered in a county in Texas. You can then use our interactive map to see the percentage likelihood that this vehicle was flooded during the hurricane. To learn more, you can opt for the vehicle’s full history report. You might be thinking, "I don't live in Texas, so this isn't a concern of mine." However, vehicles from counties severely affected by Hurricane Harvey have appeared all over the country. In fact, 16,452 Hurricane Harvey vehicles have been sold in states excluding Texas - that number increases to 117,769 when you add Texas. 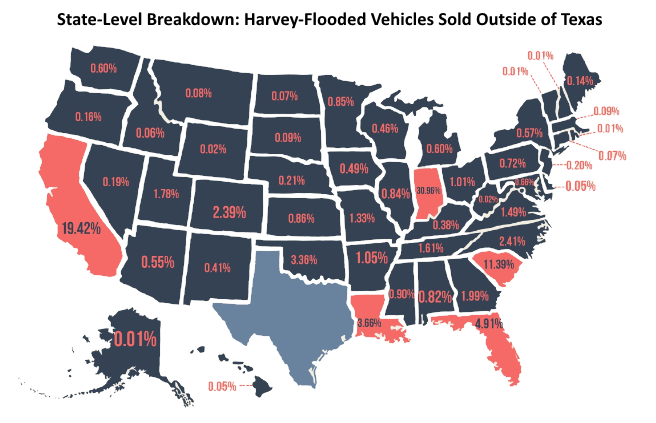 Indiana and California have the largest number of Hurricane Harvey cars sold outside of Texas. Nearly 5,100 of these vehicles have been sold in Indiana (30.96%) and 3,200 in California (19.42%). As you can see by the chart below, the number of these vehicles continues to increase. Is there rust, water stains, mold or mildew throughout the vehicle? Is its interior damp in random spots? Does the car smell unusual? Not that “new car smell” but more like a wet dog smell. Turn on the heat and air conditioning and keep the windows up - does it smell now? Does the vehicle smell like someone went through and cleaned it excessively? Is that stench of disinfectant so strong you can barely breathe? Are the electrical components of the vehicle running smoothly? Ask to take it on a test drive to make sure before the purchase. Are the lights throughout the vehicle foggy or filled with moisture? Is the vehicle being sold for less than market value? Why? Did you run a VIN Check on this vehicle? Did anything suspicious come up as a result? Did you request a full history report? Is there anything odd in this? If something seems suspicious, ask a mechanic or another expert before making that purchase. These vehicles are all being listed anywhere from an average of 3.67% to 37.23% below market value.